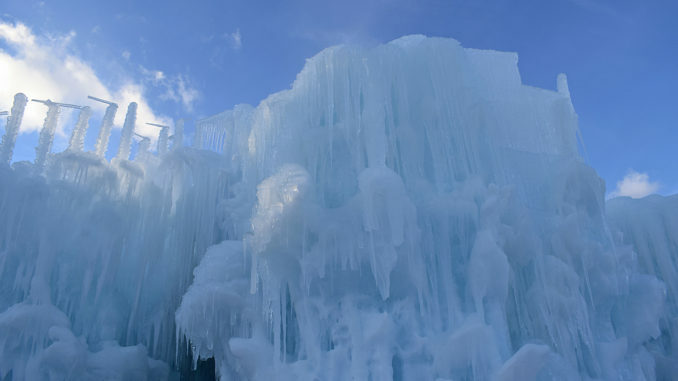 Ice Castles, New Hampshire is a beautiful, yet fragile attraction. Snap romantic photos inside New Hampshire’s ice castle. New England’s most ephemeral attraction’s days are numbered. Get your tickets now to see Ice Castles, New Hampshire… before this frozen fortress succumbs to the evil forces of… spring! I had the chance to visit this winter-only attraction in January, and I was really impressed by its size (close to an acre) and its beauty—and I didn’t get to see it at night, when the castle is illuminated from within by twinkling LED lights. I’ll take you inside this wicked cool ice castle and share tips on timing your visit, taking the kids, capturing stunning images and making the most of your experience. Ice Castles, New Hampshire photos © 2017 Kim Knox Beckius.